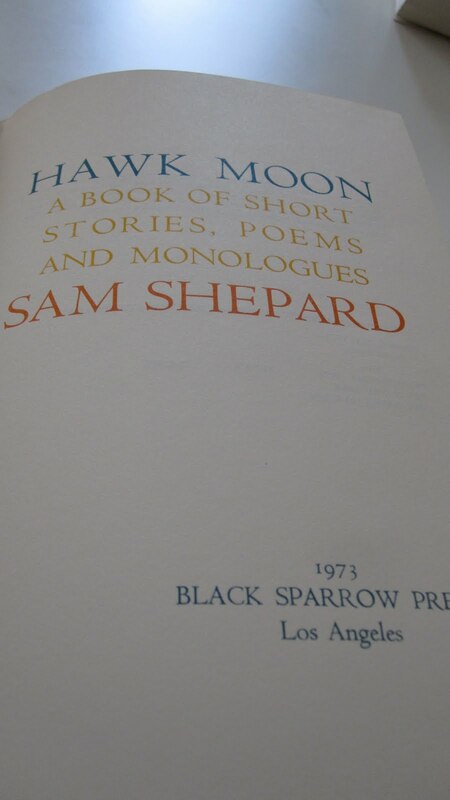 I'm very excited to share with you another rare edition from Black Sparrow Press: a signed and numbered copy of playwright Sam Shepard's first book of short stories from 1973, Hawk Moon. I first discovered Sam Shepard in the eleventh grade; I was heavily into the Velvet Underground and Shepard single-handedly sold me on all things theater-related when I read his play The Tooth of Crime for class. As I've grown older, I've become more and more fascinated with Shepard and his interplay between literature, theater, and film. Shepard is still quite prolific on the publishing front, but also finds time to act in major films and write screenplays. Two beautiful films by Wim Wenders were penned by Shepard: Paris, Texas and Don't Come Knocking (I recommend them both). As you can see on the title page, Hawk Moon is "a book of short stories, poems and monologues." The book runs just under 100 pages, and includes around 50 individual pieces. Many of these are quick, one-page vignettes that manage to capture an entire scene or lifestyle without stepping into any character development. They all feel very cathartic, as if Shepard finally found an outlet to write without any constraints of form. 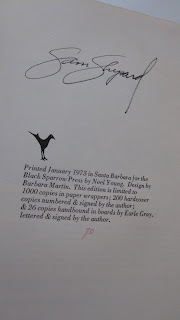 This edition of Hawk Moon is limited to only 200 signed and numbered copies. It's bound in blue boards with a thick, canvas-like spine (which sadly has worn into a rust color on the edges of my copy). 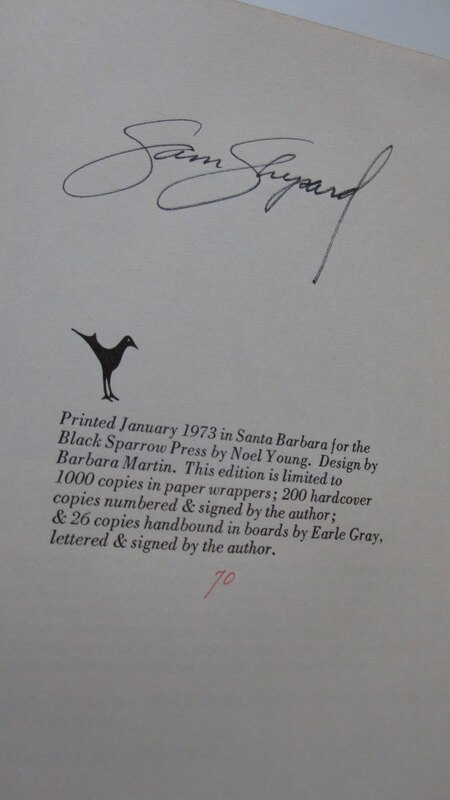 This is copy #70.